Sidney is a 61ft Tug style narrowboat. Built by the reputable Paul Barber, a Nottinghamshire based builder of niche market quality hulls with elegant lines made from British steel. These boats are produced to a high standard on an individual basis. After construction this tug was fitted out by Paul Garner and the excellent paintwork was completed at Stowe Hill Wharf. Sidney has a good size tug deck, under which there is sufficent space to offer the option of another double berth. At the front of the deck stands an impressive navigation spotlight with provenance. It is from a 1951 London fire engine, a beautiful piece of history which will be considered as part of the sale. Enter from the deck into into the saloon, a beautiful room lined with oak T&G. This houses two armchairs, solid fuel stove and TV / DVD combo. The galley follows, with side hatch, solid oak worktops with built in oven, gas hob and a 12v fridge. A walk through bathroom area is next, which has a cassette wc and a 4 ft bath with shower over. Exiting the bathroom you enter the bedroom, with crossbed arrangement, two portholes and a wardrobe. Leading to the engine room, housing the Beta Marine 40HP JD3, serviced by the owners every 200 hours. Finally there is a back cabin housing a daybed, cupboards and an electric stove. The aft cabin boasts some very attractive traditional decorative woodwork painting. 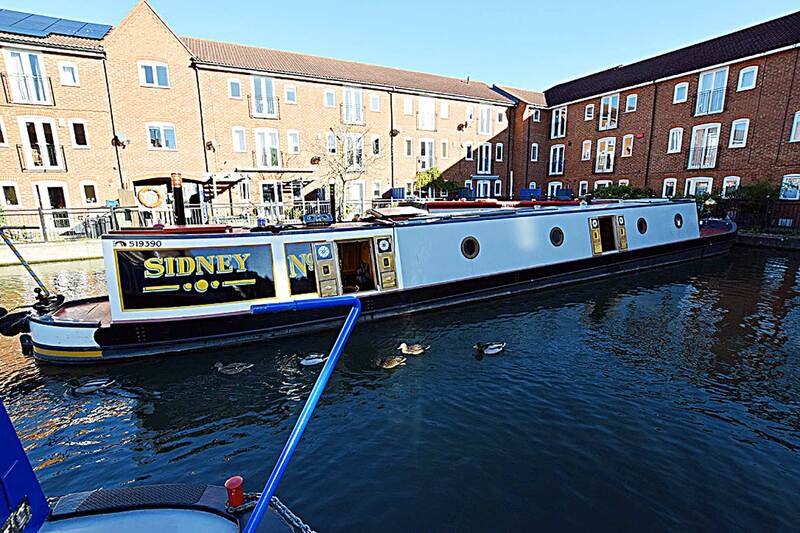 Sidney a 61ft Tug style narrowboat is a quality boat, a beautiful combination of tradition and comfort. Sidney runs well, handles well and is a real head turner!